Officer of the Second Temple, whose duty was at certain times of each day to announce the rite to be performed, and to remind the appointees of their respective parts in the performance of that rite. Thus he would cry out: "Priests, attend to the sacrifice; Levites, attune the hymn; Israelites, take your places" (Sheḳ. v. 1; Yer. Sheḳ. v. 48c). Gebini's voice is said to have been once heard by Agrippa at a distance of eight miles, whereupon the king richly rewarded him (Sheḳ. l.c.). Elsewhere it is said that his proclamations in the Temple were often heard at Jericho, a distance of ten miles (Tamid iii. 8.; Yoma 20b; Yer. Suk. v. 55b, incorrectly ). 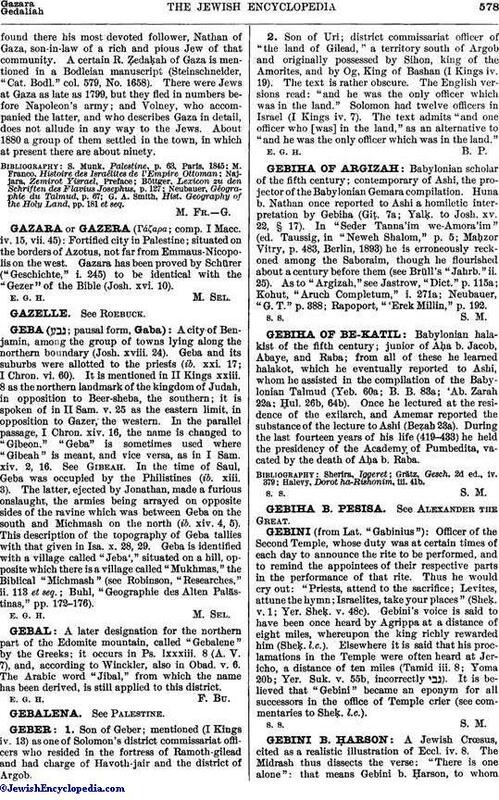 It is believed that "Gebini" became an eponym for all successors in the office of Temple crier (see commentaries to Sheḳ. l.c. ).